Don't Let This Happen To You Either! Safety is always important, no matter how experienced we are. Reader Kevin Cuyler sent this email and photos of his own painful safety experience, with permission to publish it to help other airgunners. I'll say it again: it takes a real man to admit he made a mistake, and even more so to admit it in public. Kevin, thanks for sharing! After reading your blog posts under Safety, and the one on "Don't let this happen to you", I just had to share something similar that happen to me recently. I call it "Doing Dumb Once". 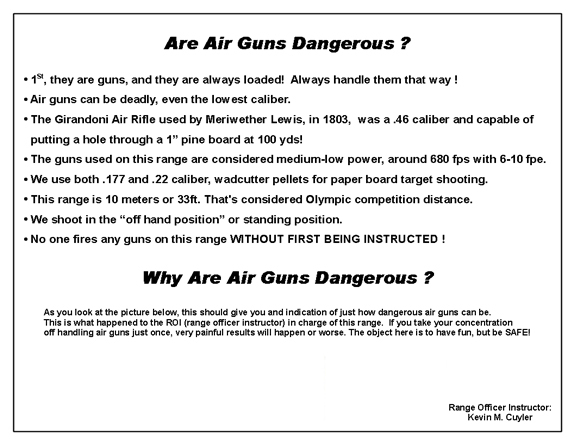 The attached photos will expand on what I now post on the rear wall of my 10M indoor basement air gun range. I've been shooting both firearms and air guns since 1958. The first thing my father taught me..."THE GUN IS ALWAYS LOADED!" I did dumb just once and paid the price. I was degassing my modified Crosman 1077. I always store the airguns with the clips out and unloaded, so I thought! The modified 1077 only gets about 24 shots then the pressure falls off quickly. I wanted to know how much was left to be able to unscrew the piercing assembly and release the rest of the gas. I put my left index finger just slightly over the end of the barrel. I forgot to remove the clip. One round was left. 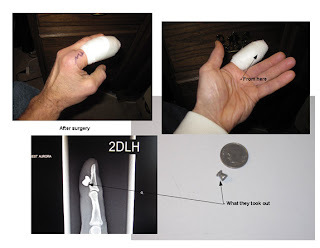 There was still enough energy to put it into my finger, only stopped by the bone, otherwise it probably would have went through." 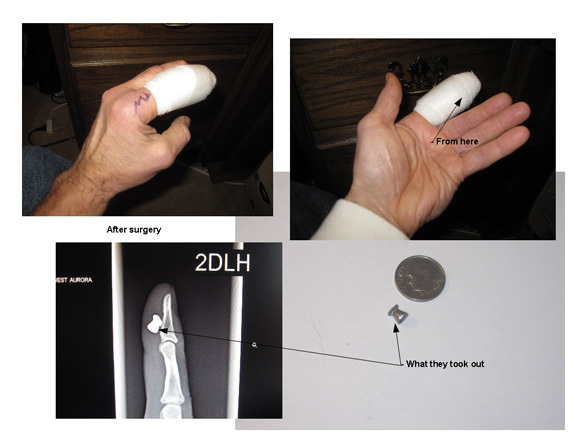 Below, Kevin's bandaged finger and X-ray of the pellet inside the finger. Click to enlarge photo. Ouch! Will I ever do DO DUMB AGAIN ??? They say, the older you get, the smarter you get ??? Go ahead and post this if you please." Below. Kevin now has this notice on the wall of his range. Click to enlarge photo. "Would you believe that the doctor who did the surgery, and on the day he took the stitches out, said he had to do another surgery that day on a guy that shot a pellet into his hand ??? Here's a group photo of four of the five current Archer Airguns Repeater prototypes. 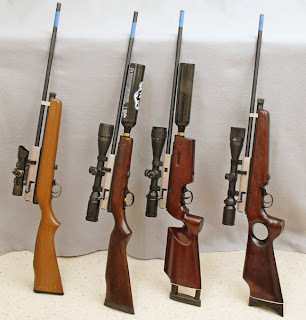 The fifth is currently in use as we develop our Upgrade Kits for these air rifles. 1 - Crosman 160 Repeater wearing a red dot sight .22 caliber, of course. 2 - QB79 Repeater in .22 caliber. Old Leapers 3-9x40AO scope. 3 - AR2079A Repeater in .177 caliber. 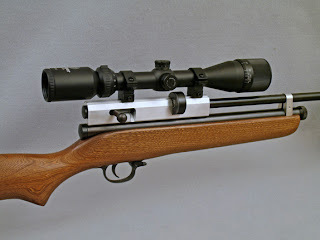 New Leapers 3-9x40AO scope. Benjamin single shot tray. 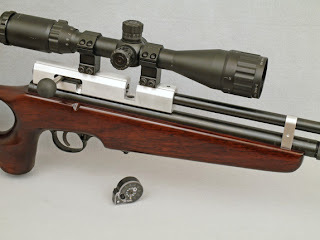 4 - QB78 Repeater in .177 caliber with AR2078 thumbhole stock and Stoeger 3-9 x 40AO scope. Note that guns 3 and 4 have 40mm diameter scopes mounted with LOW rings. 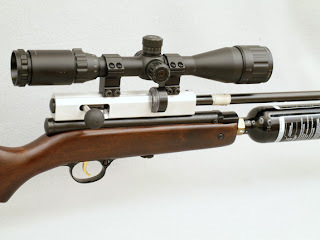 As the breech is higher than the barrel, the scope can be mounted with lower rings than usual. This gives improved cheek weld, compactnes and appearance yet there's still clearance for the magazine. The 9-ounce paintball tanks do not touch the barrels of guns 2 and 3 - it's just the perspective of the photograph. Functionality testing should be completed quite soon. All the major bugs have been ironed-out and there's just a few additional refinements to be incorporated before we "press the button" for the first production run. Once we have "final, final" configurations, we'll do some serious performance testing and post the results here. Coming soon from Archer Airguns is the first ever mass-production self-indexing, 10-shot upgrade for the Crosman 160 - the 160 Repeater. The 160 Repeater Upgrade Kit can be retro-fitted to any existing Crosman 160 .22 caliber air rifle - even if it’s over 50 years old! There will also be a 167 Repeater Upgrade Kit available to upgrade .177 caliber Crosman 167 air rifles. The photographs here show a pre-production kit fitted to my “Type 3” Crosman 160. The production versions will have black finish parts. The above photo shows the magazine in place and a scope fitted. 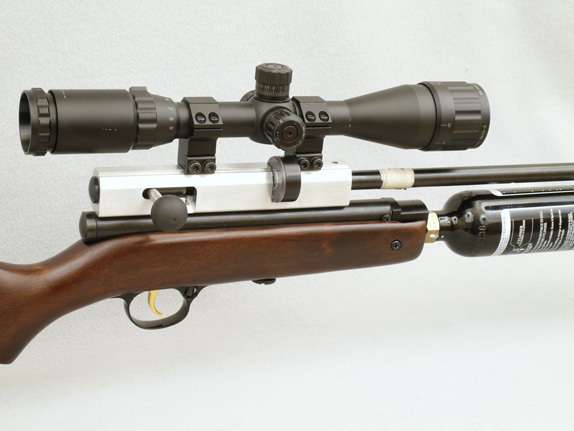 The 160 Repeater uses the well-known 10-shot Benjamin Marauder magazine. 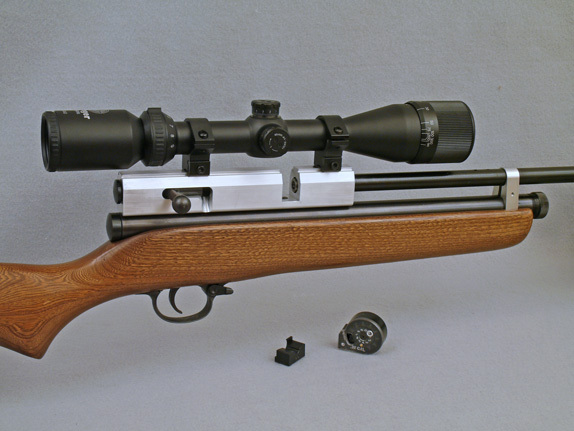 It can also be used in single shot mode by using the Benjamin Marauder Single Shot Tray. Like the original Crosman 160, the 160 Repeater Upgrade Kit is designed in Fairport NY (by Archer Airguns) and manufactured in the USA! - The Breech and barrel band are precision CNC-manufactured from aircraft-grade Aluminum. The bolt is CNC-manufactured from high quality steel. The 160 and 167 Repeater Upgrade Kits includes all the parts required to upgrade any existing Crosman 160 or 167 with “drop in” assembly. 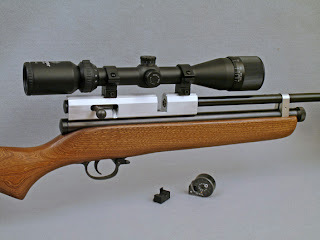 This photo shows the magazine and single shot tray below the air rifle. Current expectations are for availability in July/August. 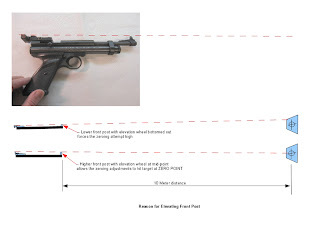 Again, the photo is of a pre-production test gun. Final production will be of very similar appearance, but the new breech and barrel band will be in black finish. Archer Airguns also has repair and upgrade parts available for the Crosman 160. 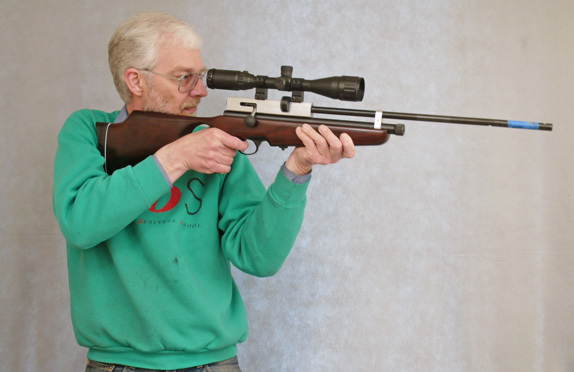 This is a wonderful opportunity to give a new lease of life to many much-loved old Crosman 160 and 167 air rifles! If you would like to be informed when the 160 Repeater is available, please email us at sales@archerairguns.com, with “160 Repeater” in the title. 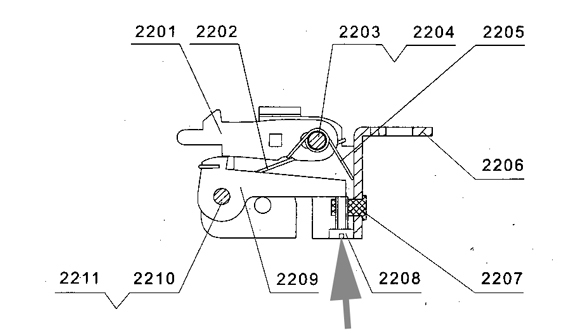 “The sear adjustment screw (Part 2208) can sometimes work loose due to oil on the threads from manufacture. The screw can then back out a little from its factory setting. If it does this, misfires can result. Simply adjusting the screw should cure the issue. 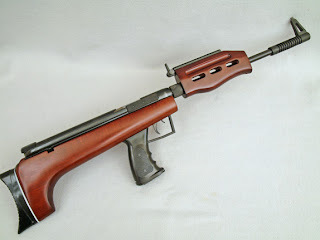 To do this, remove the rear ‘main’ wood stock by unscrewing the screws 4700 and 4400. The stock just lifts off the action. 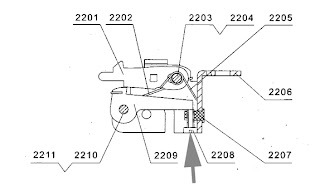 Below is a scan from the QB57 Owners Manual showing the location of Part 2208, the sear adjustment screw. 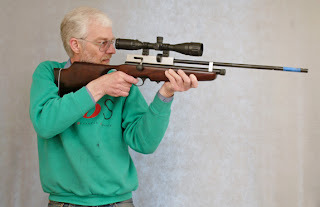 The following post comes from Kevin Cuyler, an Archer Airguns customer who fitted an Industry Brand Rear Field Sight to his Crosman 2240 (fitted with Crosman steel breech). Kevin found that his gun shot high with the standard front sight. 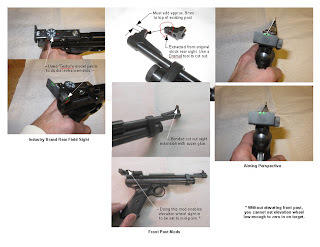 So he made an innovative extension for the front sight blade using a part of the plastic Crosman sight supplied with the gun but unusable with the steel breech. Kevin has kindly offered to share his experience with a wider audience through this blog. His photographs are annotated to make them self explanatory. If you click on the photographs, they will enlarge for easier viewing. In the first picture, Kevin explains the problem he faced. The montage below includes descriptions of the changes he made. Here's some initial performance data for the QB78/QB79 Repeater. During our functionality testing, we've seen strong muzzle velocities and good accuracy with all QB78 Repeater and QB79 Repeater test "mules". However, Paul made a first controlled "Gold Service" test this week and the test target is shown here. The gun was .22 caliber QB79 Repeater "mule" number 3 and the pellets, Crosman Premier Lights. Double click the target to see a bigger view. 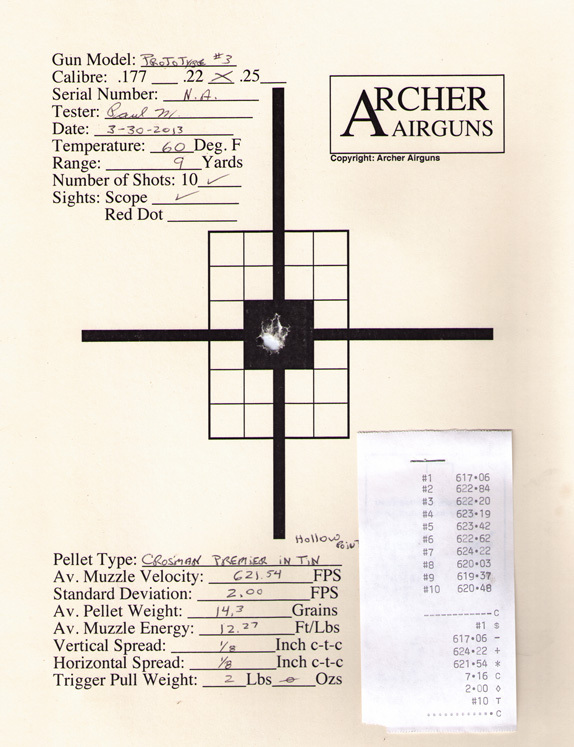 As you can see from the test target above, the muzzle velocity achieved was 621 fps at just 60 degrees F. Given other experience of QB78 performance, this allows us to predict possible muzzle velocities for the QB78 Repeater and QB79 Repeater. Based on this data, we would see a muzzle velocity for this gun of about 630 fps in .22 caliber at 65 degrees F (our normal testing temperature), climbing to 660 fps at 80 degrees F.
The equivalent muzzle velocities in .177 caliber would be about 730 fps at 65 degrees F and 760 fps at 80 degrees F.
This is a first "hard" data point for the QB78 and QB79 Repeaters. We'll make more tests before deciding on specific muzzle velocity specifications for these new models. And one other point. Please look at the Standard Deviation. It's just 2.00 fps. Paul fired at a steady rate and wasn't timing, but he certainly completed the string in less than a minute. 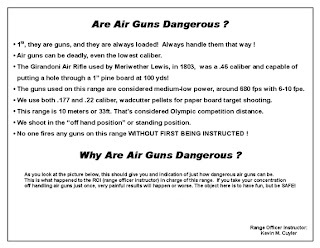 This indicates that the QB79 Repeater may not be seriously troubled by falling muzzle velocity with rapid fire which is, of course, inherent in all CO2-powered air rifles due to the high capacity of the 9-ounce tank. Accuracy is proving to be excellent, as you can see with this 10-shot group. The longer breech with twin - and much longer - barrel setscrews is the probable cause for this. We'll publish more test results as they become available. Coming soon - the QB78 Repeater. Also the QB79 Repeater. Coming soon at Archer Airguns are the QB78 Repeater and the QB79 Repeater. 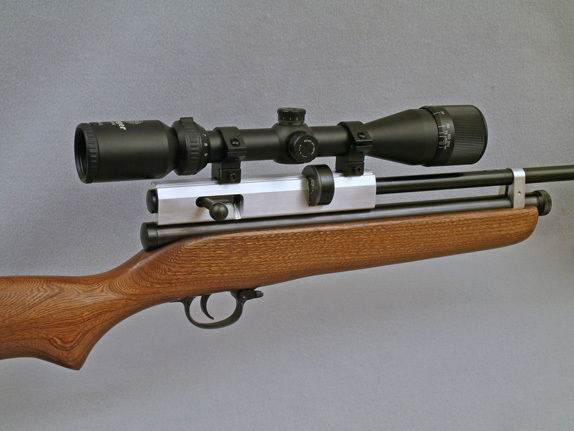 These airguns use the well known 10-shot magazine from the Benjamin Marauder and provide self-indexing, bolt action magazine fire for the QB78 and QB79 platforms. The photographs here show some of our pre-production test mules. The production versions will have black finish parts, no identification tape around the barrel etc! Above, A QB78 Repeater prototype. Below, a prototype QB79 Repeater. There's some more information on the QB78 Repeater. The QB78 and QB79 Repeater Upgrade Kits will include all the parts required to upgrade any existing QB78, AR2078, QB78 or AR2079 model with drop in assembly. Again, the photos are of pre-production test guns. Final production will be of very similar appearance, but the new breech and barrel band will be in black finish. The Oversize Bolt Handle is an optional accessory.